Apples & Wages, an undergraduate urban planning studio project, presents a program to increase food security and employment in the Tenderloin neighborhood of San Francisco with a job-training program that offers skill development and employment experience in food preparation and distribution. Taught by Andrea Gaffney and Kimberly Suczynski Smith, the students Dylan Crary, Heather Do, Rebecca Hui, Sandra Lee, and Christina Tanouye come from a wide range of disciplines including urban studies, business, architecture, and political economy. The final studio presentation of “Apples & Wages” came a long way from the scattering of ideas that developed at the beginning of spring semester. For the final studio project, our team tackled the broad assignment of creating an innovative economic development proposal for the Tenderloin area of San Francisco. The assignment asked us to propose a long-term plan and a short-term, immediate action in which to test our long-range plan. Like many good planners, we started our project with extensive background research and numerous site visits. We scanned the study area for possible economic development opportunities that were not directly addressed in the planning studies that we had researched. 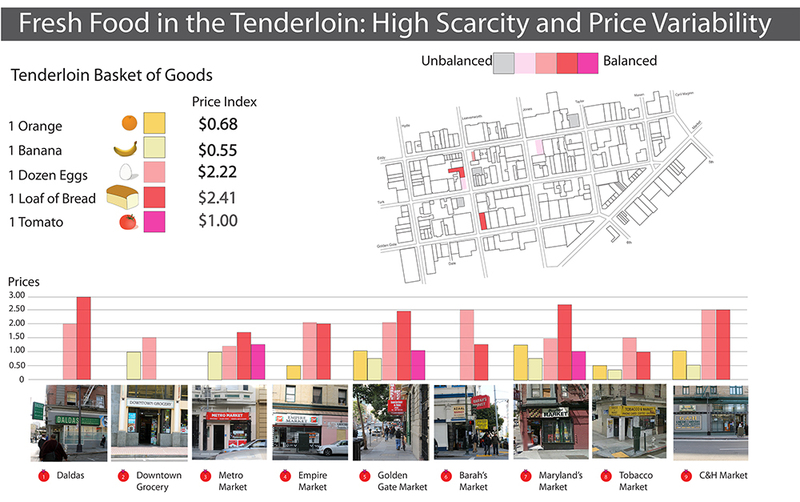 The corner stores and street culture of the Tenderloin caught our attention as a significant economy, about which we wanted to learn more. 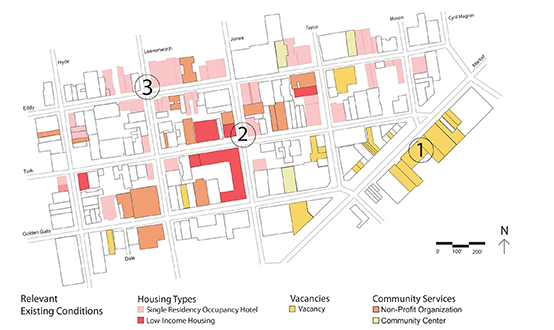 We recorded existing land uses in great detail, noting the businesses and organizations present in the neighborhood. 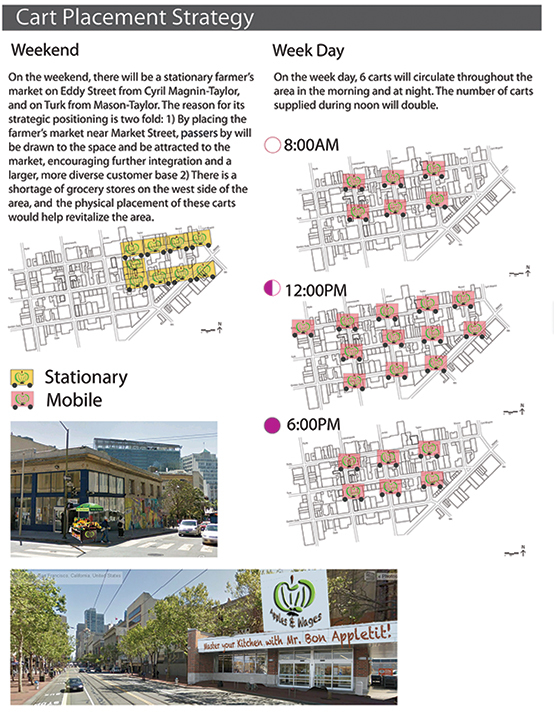 We noticed a disparity in the pricing of fresh food at the corner stores, so we created a map and pricing index to reflect the community’s access to local sources of fresh food. We documented activities on the street and talked with long-time Tenderloin residents to better understand the needs and issues in the neighborhood. From census and planning research, we learned about the high unemployment rate within the working age population of the Tenderloin community. 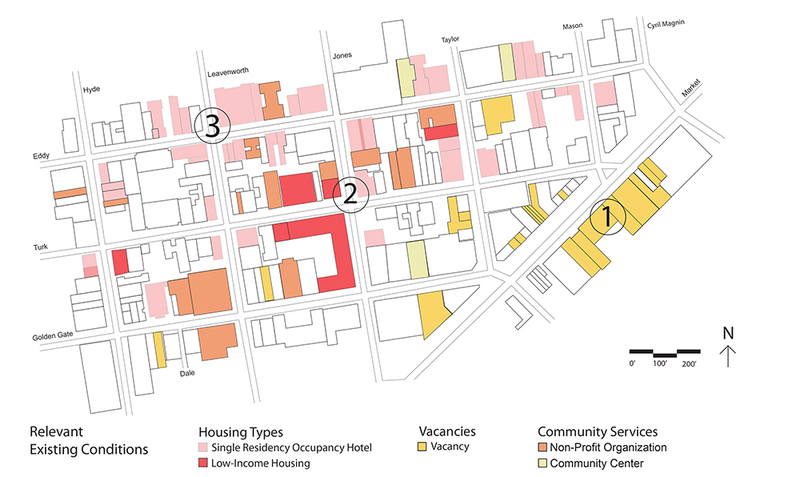 As part of our land use research, we noted Single Resident Occupancy Hotels (SRO’s) as the predominant housing type; there are no kitchens in SROs. The site visits allowed us to think on our feet and helped us arrive at our idea to propose a job-training program that could also provide access to fresh, healthy food. 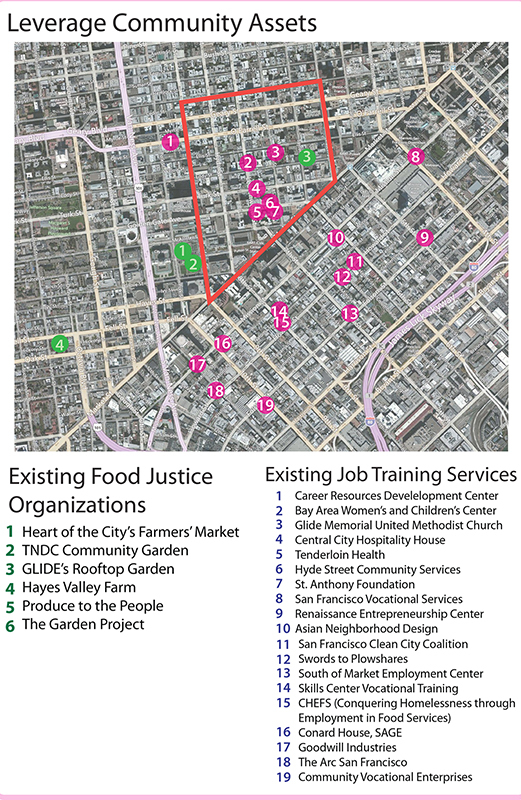 The idea is surprisingly simple: we propose the creation of a central kitchen where fresh produce could be prepared into healthy meals through the jobs training program, and then sent throughout the Tenderloin on mobile food carts. Throughout the development of our project, we looked at a variety of precedents and case studies to provide the proof-of-concept for our proposal. 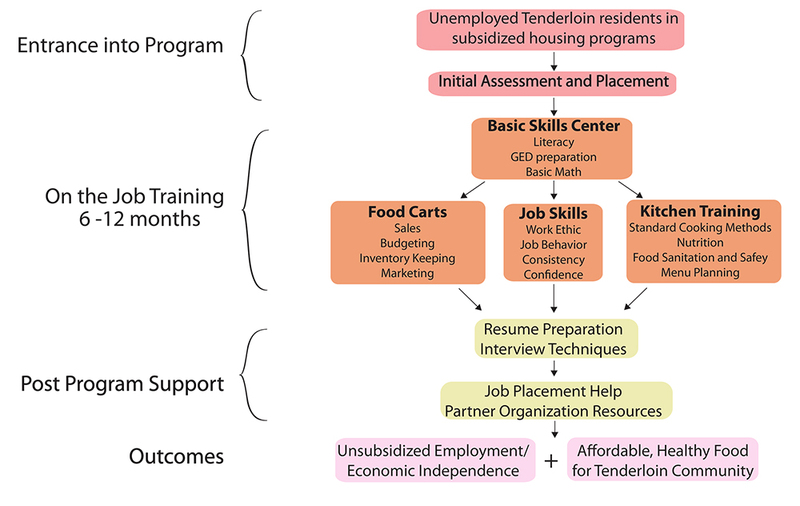 We found some excellent examples of programs and organizations at work in the Bay Area and California, from which we developed a kit of parts for our proposal. We also identified a series of funding opportunities and local organizations that might be interested in further developing our idea. 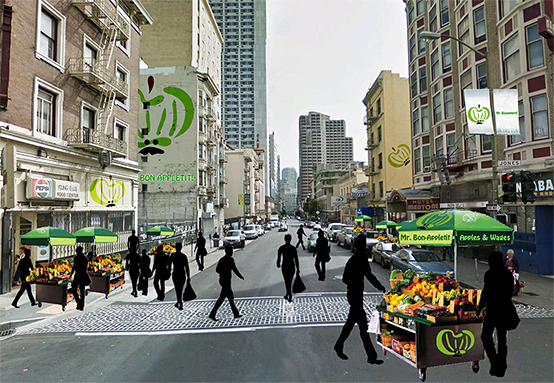 After the final studio presentation, our instructors encouraged us to present “Apples & Wages” to the Mayor’s Office of Economic and Workforce Development, and through this exposure, we took advantage of submitting our idea to San Francisco’s Online Ideas Competition for Food Security in the Tenderloin over the summer. Talk about good timing! The jury loved our proposal and we won an internship at the Hub, a social venture incubator space, where we will continue developing our project to turn “Apples & Wages” into a real program for the Tenderloin. Thinking back on all those late nights spent at Wurster Hall, we are tremendously excited to see how all our hard work will truly give back to the community. 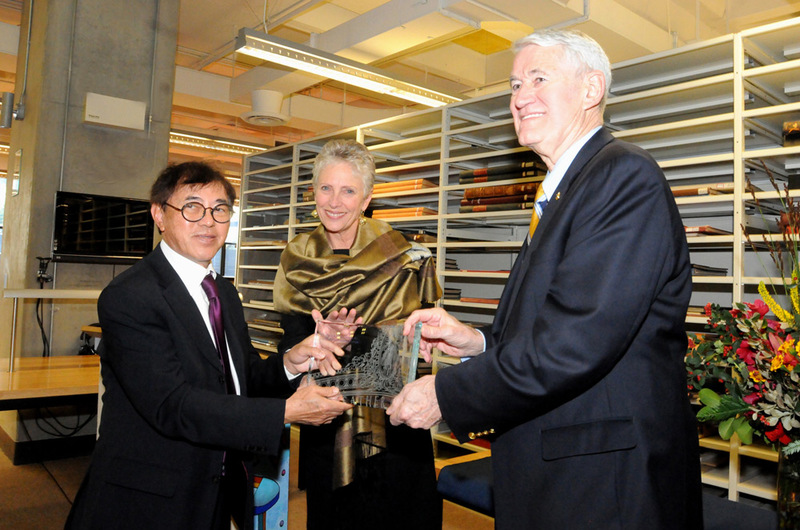 Whether it’s designing a garden or the groundscape for one of the world’s tallest structures, for John Wong (B.A. Landscape Architecture, 1974) there are three things that characterize the role of landscape architecture: creating a space where people can interact, inspiring sustainable innovation and defining a sense of place. 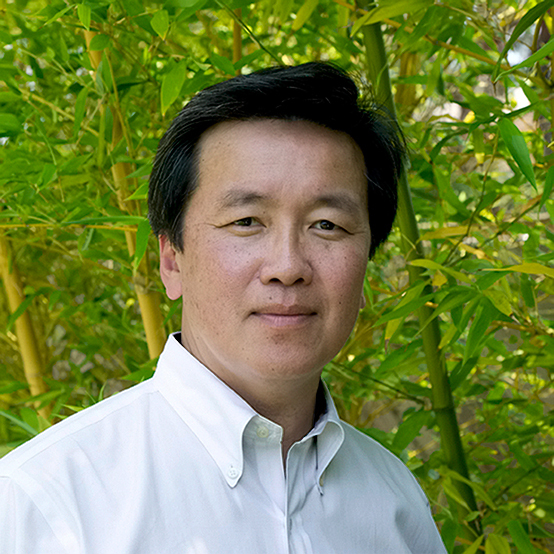 As managing principal and chairman of SWA Group in Sausalito, John Wong is an internationally renowned landscape architect with an impressive portfolio of prominent and sustainable projects throughout the world, from new communities and cities to public plazas and gardens. He is most recently recognized for his expertise in designing the groundscapes for super-tall structures—an area that now comprises over half of his practice. In addition to creating the ground planes for the world’s tallest building, Burj Khalifa in Dubai, and the Shanghai Tower, scheduled to complete in 2016, he is also currently working on designs for Kingdom Tower in Jeddah, which will rise to an estimated 1000 meters in 2017. Designing for tall buildings poses a unique challenge: to connect an imposing structure with the existing fabric of the surrounding area to create an interactive environment that makes people’s lives better. Wong is a strong believer in the sustainable benefits of high density, multi-use tall buildings with habitable open areas. He views sustainability in both ecological and human terms and sees landscape architecture as the discipline that can have the most profound impact when it comes to solving one of today’s biggest problems—how to make cities more livable. In his winning competition proposal for the Suzhou Industrial Park Central Business District, Wong highlights not only the beautiful natural location, but also the connection between ecological and social environments. The project is organized along a central urban axis, Suzhou Corridor, surrounded by five distinct rings of landscapes and pedestrian walkways that unify the landscape and the architecture while providing intimate encounters with the environment. The design links dispersed neighborhoods and creates a lively outdoor mall connecting commercial and residential developments. Wong was attracted to the field of landscape architecture because of its holistic approach to solving today’s environmental and urban problems—connecting a variety of disciplines including architecture, engineering, urban planning and transportation with an understanding of natural systems. As landscape architects are called upon to bring ideas to life on a much larger and more complex scale, he feels this collaborative approach will become increasingly important. And as sustainability continues to demand innovation, this is where landscape architecture can have the greatest impact. 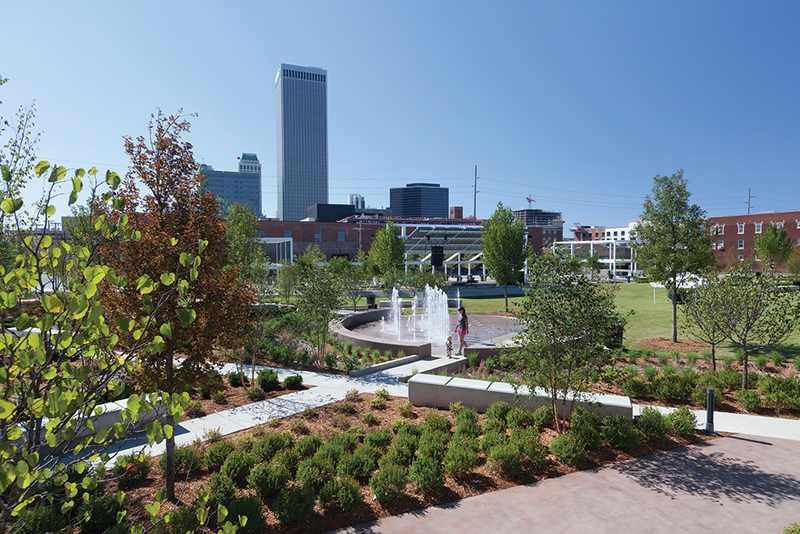 Wong’s design for Guthrie Green in Tulsa is a showcase for sustainable innovation. With the idea to create a beautiful “outdoor living room” to encourage rejuvenation of the emerging mixed-use neighborhood, SWA transformed a 2.7-acre truck loading facility into a vibrant community gathering space for artists, urban professionals, students, and visitors. SWA took advantage of the natural geothermal energy and abundant sun to create a high-performing system including photo-voltaic panels and a grid of 500-foot deep geothermal wells that help offset the park’s energy demands and provide heating and cooling for adjacent buildings. 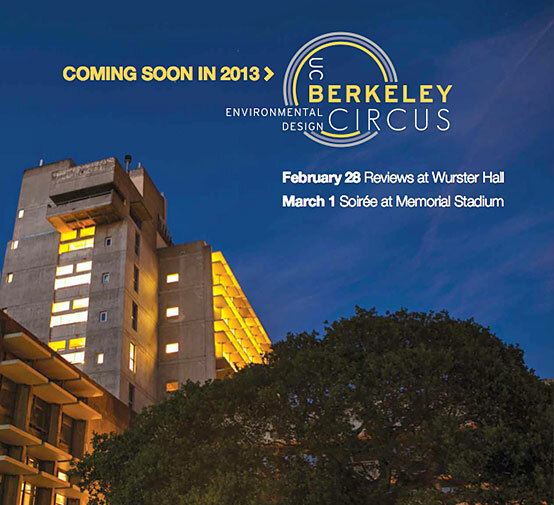 As the 100th anniversary of Landscape Architecture at UC Berkeley approaches in 2013, Wong appreciates what he gained from his experience there and what he sees the college continuing to provide: a big picture, multi-disciplinary approach that opens the mind and brings a fuller understanding of the challenges and possibilities for the future. As a new Cal parent—his daughter is at the College of Natural Resources—he’s pleased that she’ll be exposed to these critical thinking skills that will be even more highly prized in the future. In their second year participating in Vertical Cities Asia, the 5-year series of competitions focused on high-density urbanism in Asia organized by the National University of Singapore School of Design and Environment, two student teams from UC Berkeley’s College of Environmental Design were presented with the theme, “Everyone Ages.” This year’s competition sought innovative design solutions for a balanced environment for high density urban life addressing the complexities of a rapidly ageing society. Each year, a one square kilometer territory is chosen, with teams challenged to design a visionary and holistic community for 100,000 residents. The solution must incorporate areas for work and recreation with the residential component allowed to comprise only fifty percent of the total site area. This year’s site was located in Yongshan, part of Seoul Metropolitan City, Republic of Korea. The CED teams, led by Professor of Architecture René Davids, aimed to address the needs of all, removing the barriers created by age, social and family structure, and physical mobility. 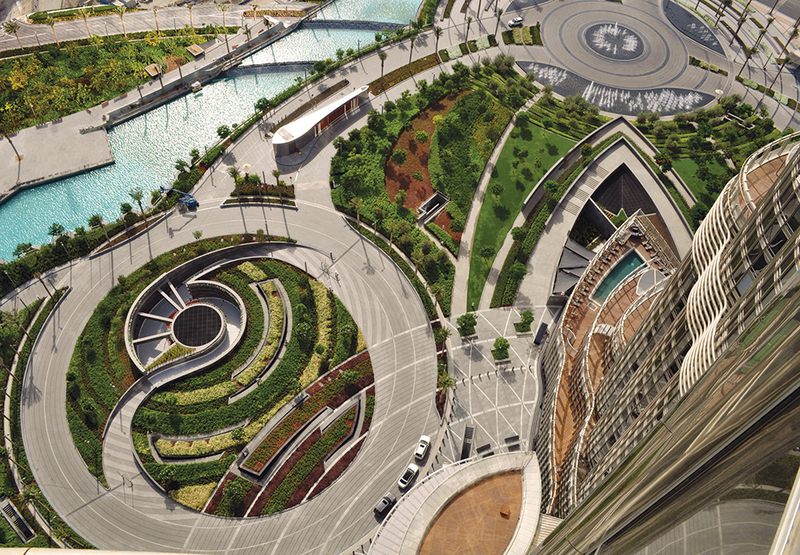 Revitalizing the connection to the river through landscape integration and optimizing views, Team A’s entry, Succulent City , embeds a dynamic and productive natural network into the existing urban context. Integrating rainwater collection, grey water filtration, recreational public space and herbal healing practice into a branching building/landscape system, the network weaves into the existing urban fabric at the ground level and extrudes vertically into programmatically efficient, branching towers. The interaction and transition between wet and dry systems permeates the city at every scale, from the urban to the individual. Inspired by the human aging process, Succulent City nurtures a relationship with the environment through sinuous bioswales and filtration basins that continuously and seasonally evolve, while respecting and responding to the diurnal fluctuations of contemporary urban life. 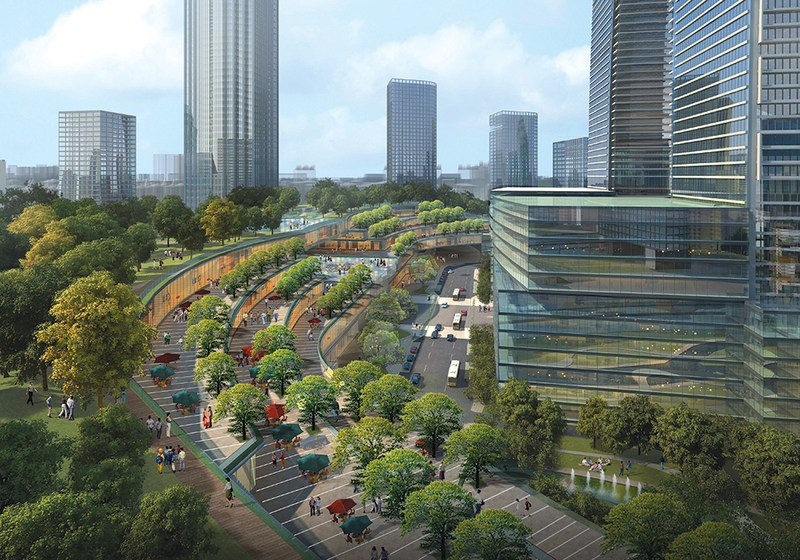 Sculpted by the natural forces on site such as sunlight and wind, and by cultural influences such as feng shui and family relationships, this organic network is oriented along commercial routes to optimize accessibility for everyone. The building network of towers, ground, and sky branches is thoroughly integrated with the wet and dry landscape, serving all ages with a gradient of mixed-use programs. Views of the river, accessible vertical swales that wrap the buildings, and ground branches that form a familiar commercial continuation of the existing streets, encourage residents and visitors to form a culturally and ecologically dynamic relationship with the landscape. 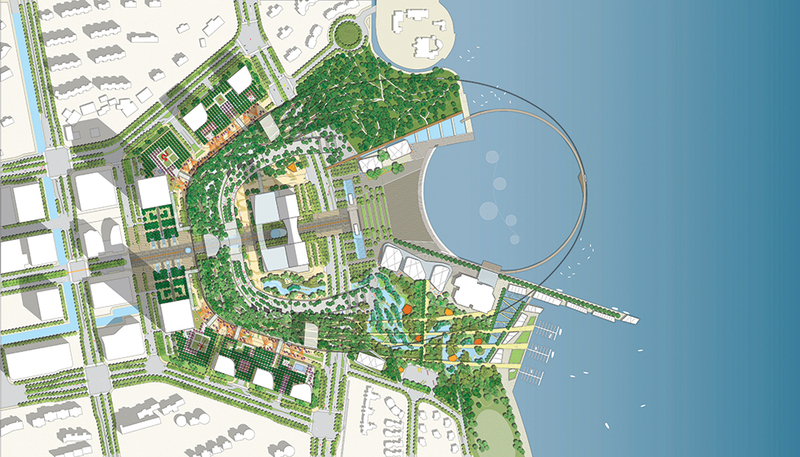 Succulent City’s approach to the Vertical Cities Asia challenge preserves the deep connection to the site’s historic and contemporary water systems, presenting a dynamic and revitalizing solution that changes, grows and adapts to the evolving needs of its urban population. Team A members Aine Coughlan, Kristen Henderson, and Ekaterina Kostyukova are all part of the M.Arch. program in the Department of Architecture at CED. How can tourism improve the lives of poor people? Must tourism always destroy existing cultures? Can indigenous people plan and manage their own tourist resources? These are just a few of the difficult questions that CED students in the graduate studio, “Just” Tourism in the Tlacolula Valley, Oaxaca , grappled with during Spring, 2012. The studio was based on the idea that to be equitable and sustainable, tourism planning needs to build on the existing environment, society and economies of the local area. Sponsored by the Ministry of Culture of the State of Oaxaca and in collaboration with professors and students from the Universidad Iberoamericana in Mexico City, students from all three CED departments—Architecture, Landscape Architecture and Environmental Planning, and City and Regional Planning—traveled to Oaxaca Valley to investigate its rich history and culture and to understand its current challenges. Raul Cabra (M.A. Design, 2011)—Director of Oaxacalifornia, a cultural exchange program between Oaxacan craftspeople and California designers, who is also a local resident—led us through ten intensive days of fieldwork that covered nearly every meter of the valley. We surveyed local agriculture and gastronomy, craft traditions, markets that date from pre-Columbian times, unique Zapotec governance systems and the techniques of artisanal mescal production—the most important local industry. We met a range of Valley residents including government officials, returned migrants, organic farmers and American expats. Returning to Berkeley, we incorporated different concepts from the anthropology of tourism, everyday urban design, local economic development theory, infrastructure planning and land-use law to create a strategic tourism plan for the Valley. Organized around flexible itineraries, the plan makes the valley accessible to tourists while protecting its physical and cultural resources. Multi-dimensional and decentralized, the plan offers numerous options. 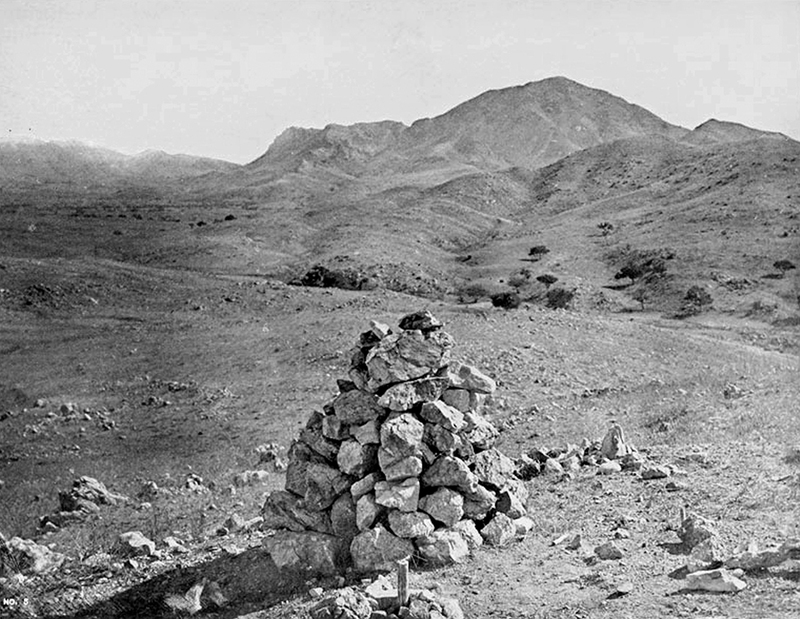 Since villages value their independence and autonomy, each element can be adapted to local conditions. Last summer, local officials, businesses, and artisans enthusiastically responded to the Mezcal Route strategy, so we are optimistic that the rest of the plan will have an equally positive impact in Oaxaca. In a now-neglected book entitled Notes on the Synthesis of Form (1964), Christopher Alexander approached design as a question of “goodness of fit” between form and context. I thought about this formulation frequently when I began traveling in 2002 the entire length of the US-Mexico border on both sides, a journey of 4,000 miles. 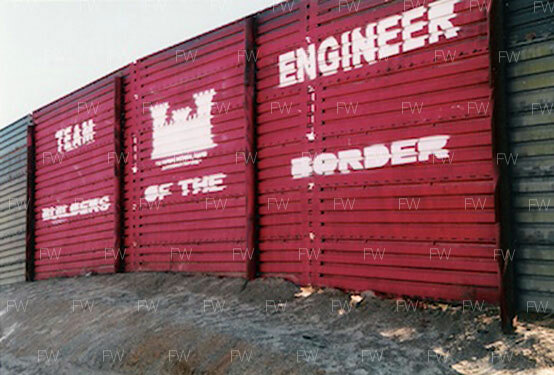 I had the good (or bad) fortune to embark before the US undertook the fortification of the international boundary line and so witnessed the border’s closure, an experience that altered my understanding of both countries. 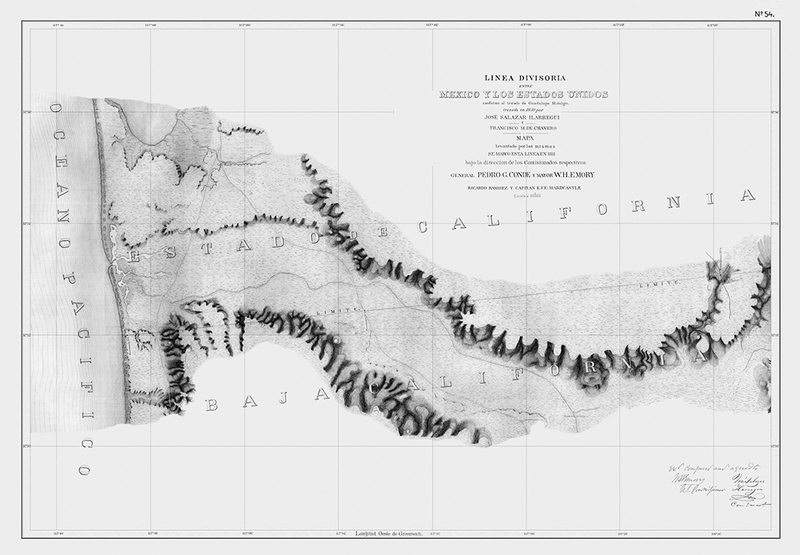 The US-Mexico borderlands are among the most misunderstood places on earth. The communities along the line are distant from their respective national capitals. They are staunchly independent and composed of many cultures with hybrid loyalties. 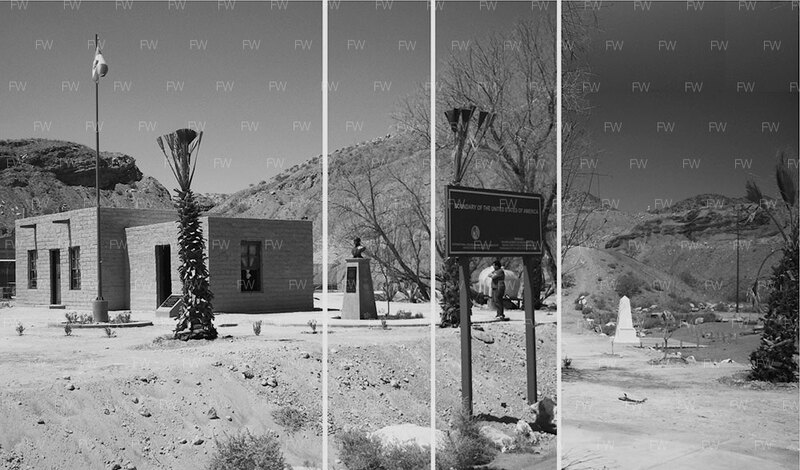 Nowadays, border states are fast-growing places of teeming contradiction, extremes of wealth and poverty, and vibrant political and cultural change. They are also places of enormous tensions associated with undocumented immigration and drug wars. Mutual interdependence has been the hallmark of cross-border lives since prehistoric times. 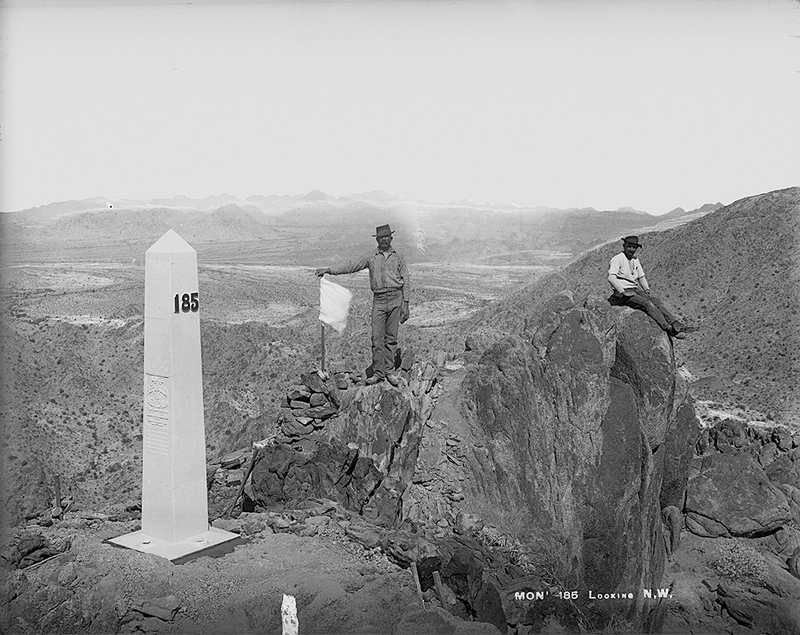 After the Spanish conquest, a series of binational “twin cities” sprang up along the line, eventually creating communities of sufficient distinction as to warrant the title of a “third nation,” slotted snugly in the space between the US and Mexico. I came to understand the third nation not as a zone of separation but instead as a connecting membrane. 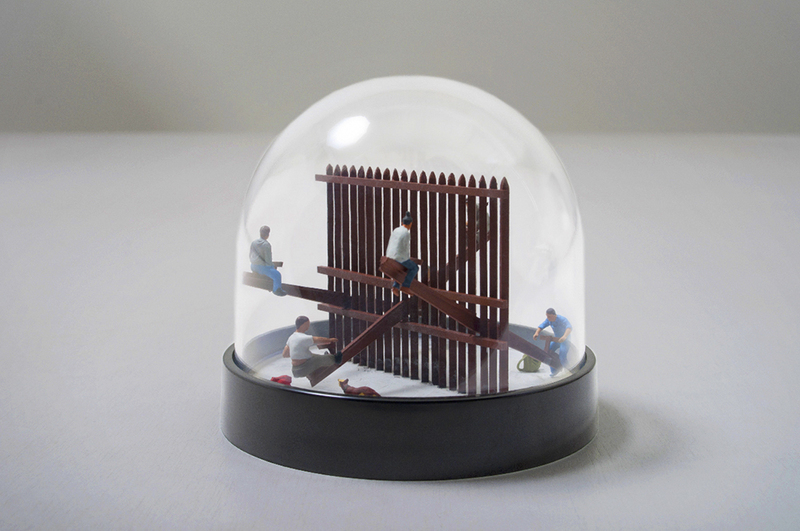 This way of seeing substitutes continuity and coexistence for sovereignty and difference, running counter to conventional wisdom that the border is the place of last resistance against immigrant and terrorist. In 1848 the Treaty of Guadalupe Hidalgo established the international boundary, which was frequently marked by no more than a pile of stones. A second survey in 1892 added over 200 more boundary monuments. 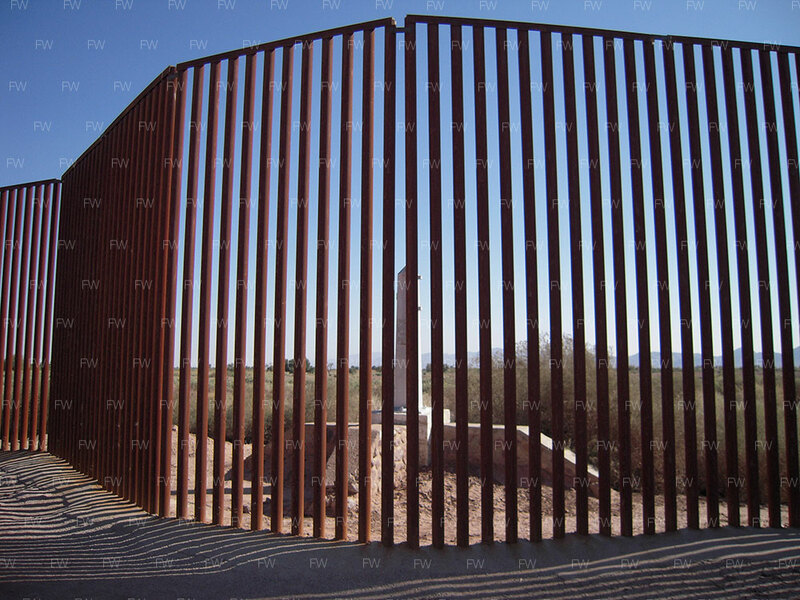 But in the 1990s, responding to increased waves of undocumented crossings from Mexico, large fences sprouted in border cities such as Tijuana and Ciudad Juárez. Following 9/11, the US unilaterally adopted an aggressive program of fortifying the entire line. The new barriers are without historical precedent, and threaten to suffocate the arteries of communication that supply the third nation’s oxygen. On the US side, the border was transformed into an archipelago of law enforcement agencies dedicated to the apprehension and deportation of undocumented migrants, and supported by private manufacturing, detention and security corporations. On the Mexican side, the federal government’s war against drug cartels resulted in tens of thousands of deaths and may even have consolidated cartel power. 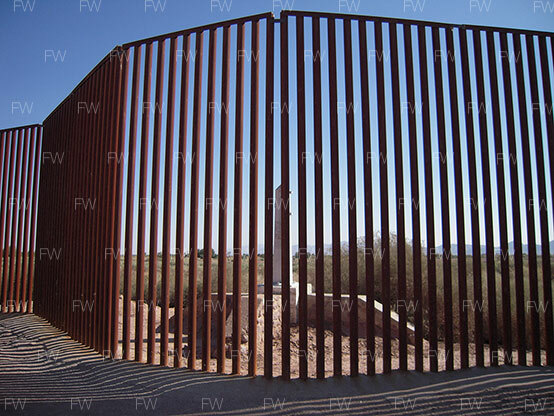 In places, the new Wall is sinuously beautiful as it snakes through desert, but it can hardly be construed as a good fit! Yet the environmental design responses it has provoked are immensely intriguing in their diversity. 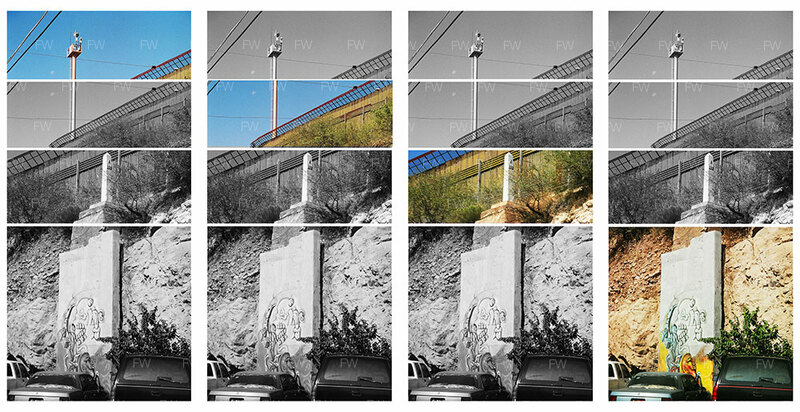 The Wall provides a canvas for artworks, or becomes an instrument to be played by musicians; and ‘windows’ cut into the Wall reduce cross-border incidents of rock-throwing. 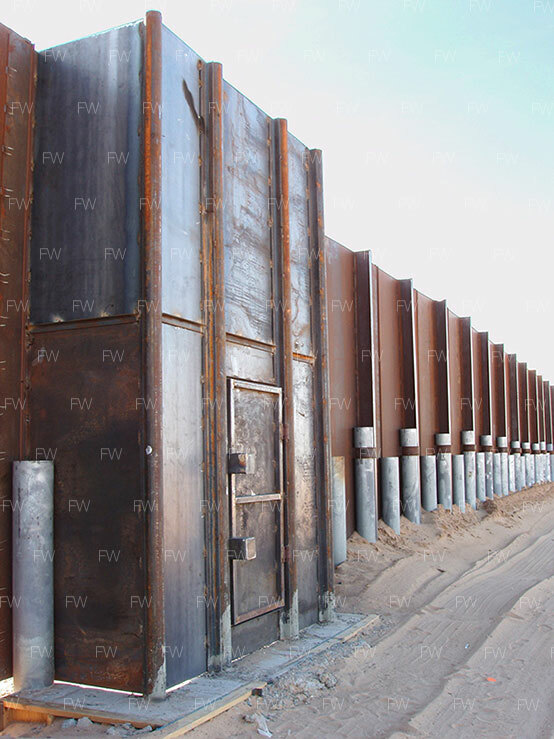 Design professionals are directly engaged in building the rising number of official Ports of Entry that establish new portals in the Wall that shuts out Mexico. 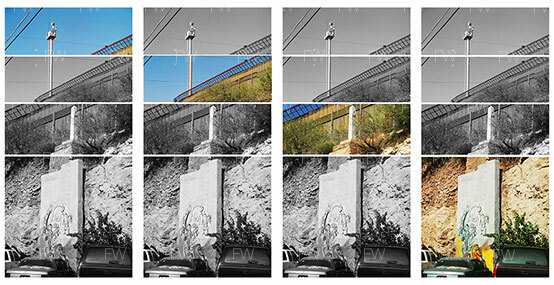 My CED colleague Ron Rael has designed water, energy and anti-pollution schemes along the Wall’s length. And people invent surprising ways of going over, under, through and around the Wall. Ultimately, the Wall separating Mexico and the US will come down. Walls always do. The Wall won’t work because the third nation has strong connective tissue that cannot be undone. The third nation is the place where binational lives and values are being created – organically, readily, and without artifice. It is the place of being and becoming between our two nations. What should be done about the Wall that so rudely interrupts the third nation? The Berlin Wall was torn down virtually overnight, its fragments sold as souvenirs of a calamitous Cold War; and the Great Wall of China was transformed into a global tourist attraction. Left untended, the US-Mexico Wall would collapse under the combined assault of avid recyclers, souvenir hunters, and people offended by its mere existence. Nevertheless, we should preserve sections of the Wall to commemorate that fraught moment in history when the US lost its moral compass. 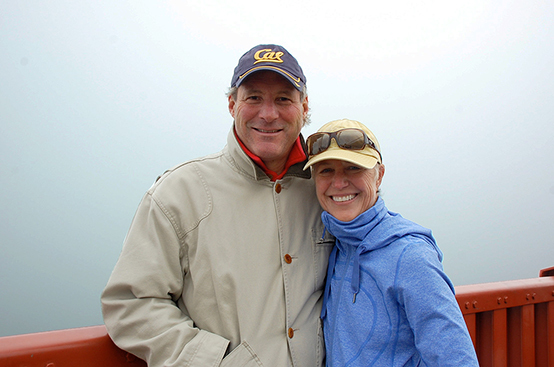 David K. Woo ’67 credits his parents with knowing that UC Berkeley was the perfect place for his higher education. 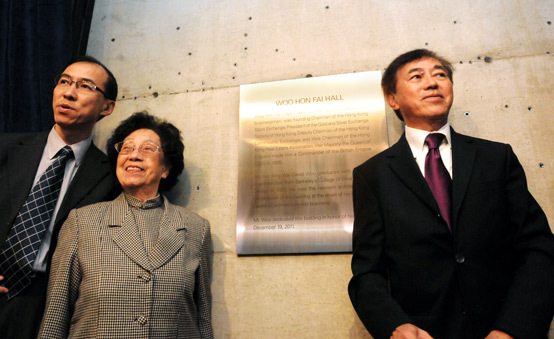 Now a successful architect, businessman and developer in Hong Kong, and director of the Hong Kong-based Woo Hon Fai Holdings, Woo made an impact at Cal even in his early years. Newly arrived as a freshman at Berkeley in 1962, Woo’s introduction to American culture was swift, but he quickly adapted. While an architecture student, Woo became the senior manager of the Cal baseball team, traveling with the likes of soon-to-be major leaguers Andy Messersmith, Bill Nye and Bill Frost. 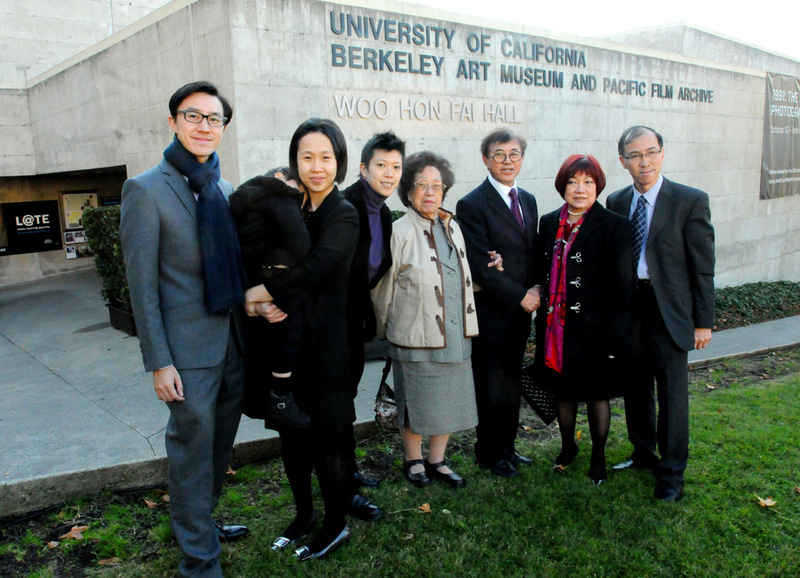 Upon his graduation in 1967 as a member of one of the first classes to graduate from Wurster Hall and the College of Environmental Design, Woo was immediately hired as resident architect for Rothschild & Riffin, the contractors of the University Art Museum, later re-named the Berkeley Art Museum and Pacific Film Archive. The award-winning structure designed by Mario Ciampi has since become a cultural hub in the Bay Area, showcasing the world’s finest art and film for hundreds of thousands of people. When Mr. Woo left California to make his mark in the world of global business and commerce in Hong Kong, he continued to give back to Berkeley by serving on the BAM/PFA board. Now CED is honored that Woo has chosen to bestow a gift of $1 million to endow a faculty chair in the College of Environmental Design. This gift is being matched with $1 million by the William and Flora Hewlett Foundation as part of the Hewlett Challenge for Faculty Support. 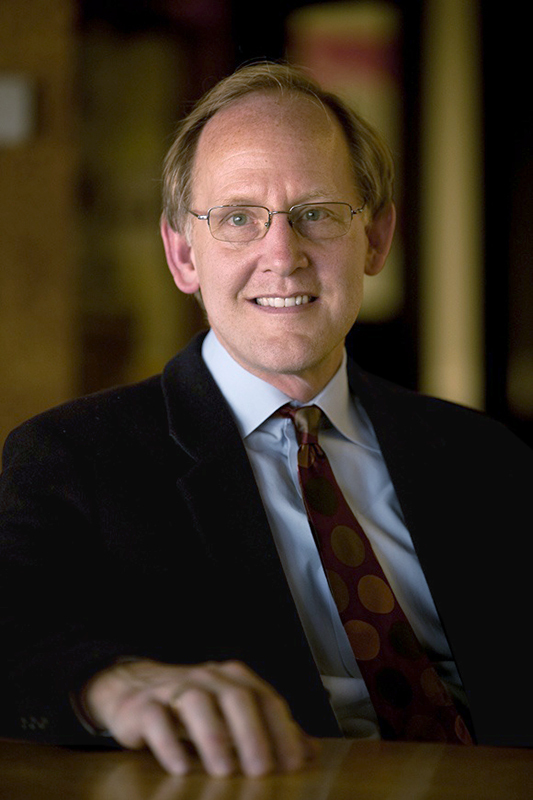 The David K. Woo Chair in the College of Environmental Design will support the work of an eminent faculty member in CED. The $1 million gift to CED is part of a major gift of $15 million given by Woo to UC Berkeley to honor his late father, Woo Hon Fai. The Berkeley Art Museum building has been renamed Woo Hon Fai Hall, to pay homage to Mr. Woo’s father and to celebrate this historic building. The elder Mr. 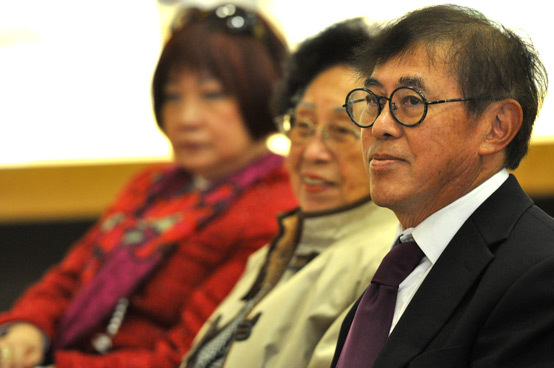 Woo, OBE, was the founding chairman of the Hong Kong Stock Exchange, the president of the Gold and Silver Exchange Society of Hong Kong, the deputy Chairman of the Hong Kong Commodity Exchange, and the Vice Chairman of the Hong Kong Real Estate Association during his storied career. Queen Elizabeth made him a commander of the Order of the British Empire before his passing more than 30 years ago. 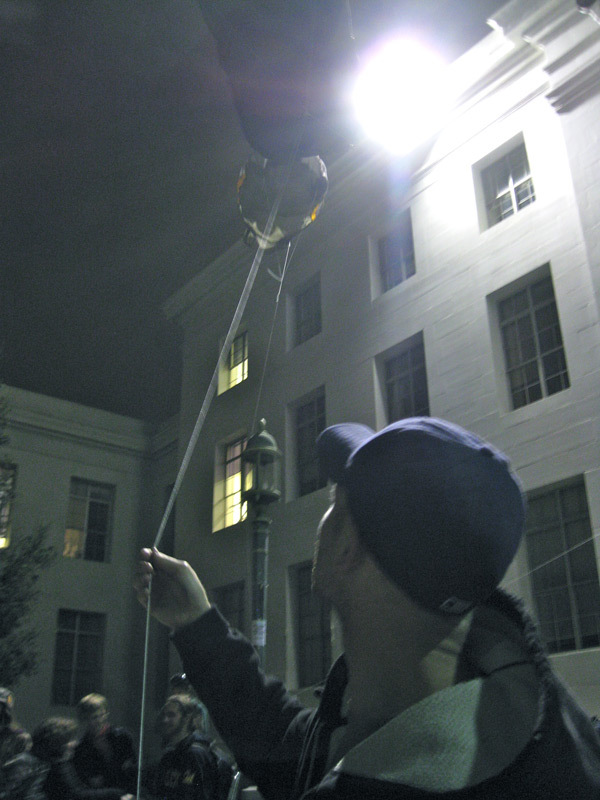 The Occupy Wall Street movement, and its cousins that have emerged in cities across the country, arrived on the UC Berkeley campus last fall in the form of “Occupy Cal.” Students set up small camping tents outside Sproul Hall in front of Savio Steps, named for the famed free speech activist, Mario Savio. Police, in a scene involving protester-police conflict and violence, ultimately removed the tents stirring controversy across campus. 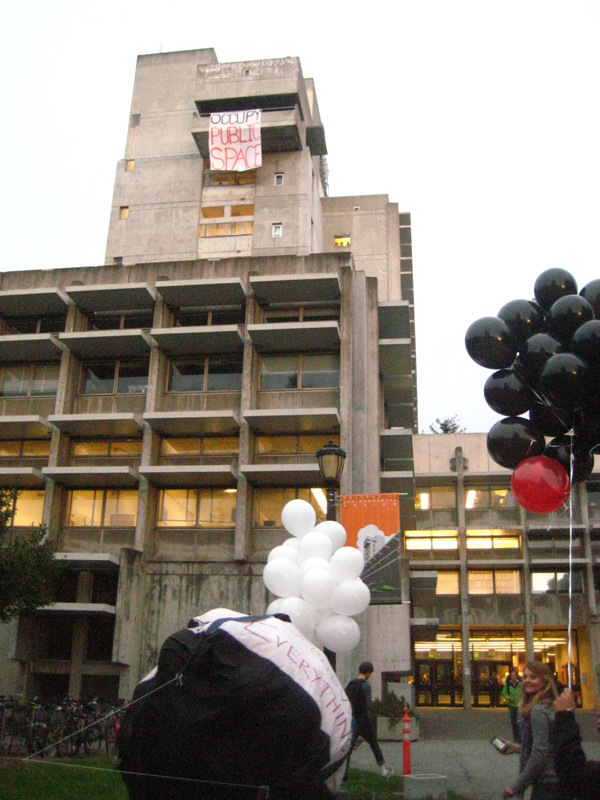 In the wake of the tent removals, College of Environmental Design students led by students from the Department of Landscape Architecture and Environmental Planning hung a large sign reading “OCCUPY PUBLIC SPACE” in full view off Wurster Hall’s 10th floor. To draw attention to the role of design in social change, they also created a unique intervention intended to provoke and amuse. 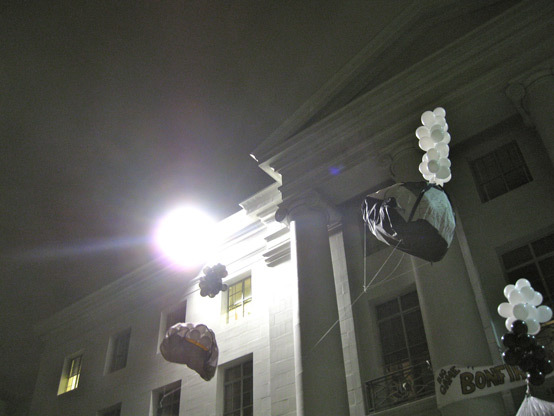 Since tents in front of Sproul Hall were banned, the students filled two tents with helium balloons, floating them on long lines, along with an enormous sign reading “OUR SPACE”. Marching down from Wurster Hall in an exuberant procession, they tethered the hovering tents and sign high in front of the Sproul Hall doors. 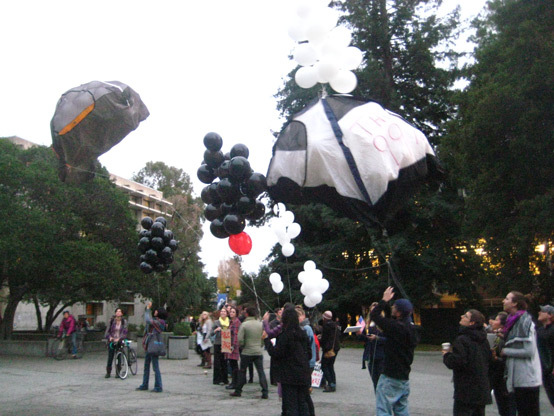 I too was out there in the cold with our students, their floating tents, and their comic signs such as “Frank Lloyd Fight!” We had an animated conversation about social justice and the future of public universities like Cal. Back at Wurster Hall, some of the students, enrolled in a graduate seminar on public space taught by Professor of Architecture Margaret Crawford, were eager to engage in a discussion about the role of public space in social protest and change. We immediately decided to organize a panel discussion, creating a locus for more serious, academic dialogue. So, on December 1st, students packed the new Wurster Gallery to hear faculty members Ananya Roy (City & Regional Planning), Walter Hood (Landscape Architecture & Environmental Planning), and Margaret Crawford (Architecture) and MLA graduate students Rob Tidmore and Chris Torres debate questions of design activism, the meanings of public space, and the serious social, political and economic issues raised by the Occupy movement. It was an electric evening of tough questions and rapid-fire exchanges among panelists and participants. 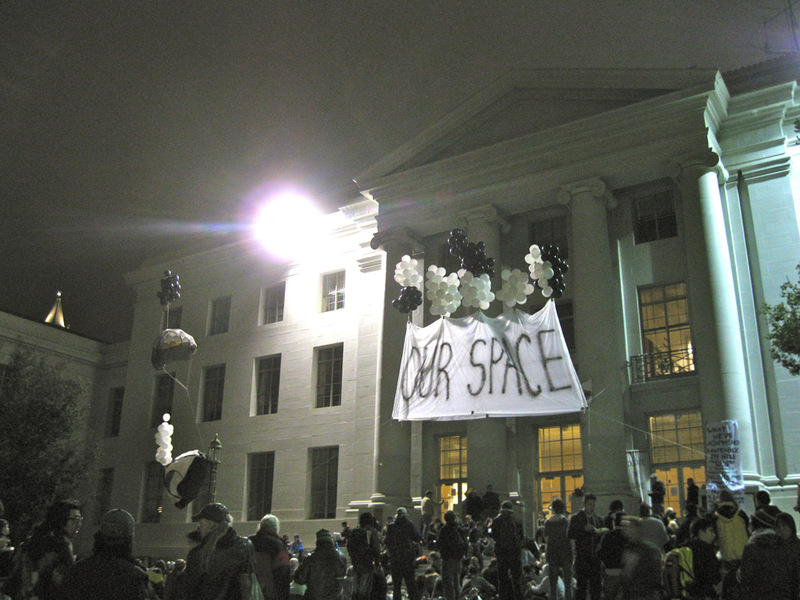 The challenges that our university and college face are rooted in the political and economic dynamics driving the Occupy movement. The entire campus community understands this. Today’s students and faculty all know that activism is a vital and cherished part of this university’s heritage, but knowledge about the strategies and tactics that actually build movements must be learned anew. We must always begin with the substantive issues, and thus along with other Cal Deans, I have worked to organize a series of campus-wide forums to explore issues of social inequality and opportunity, taxation and citizenship, the economics of higher education, and the public character of public universities. Student and faculty organizations in turn are rapidly beginning to map out strategies for mobilization and identifying political pathways for change. 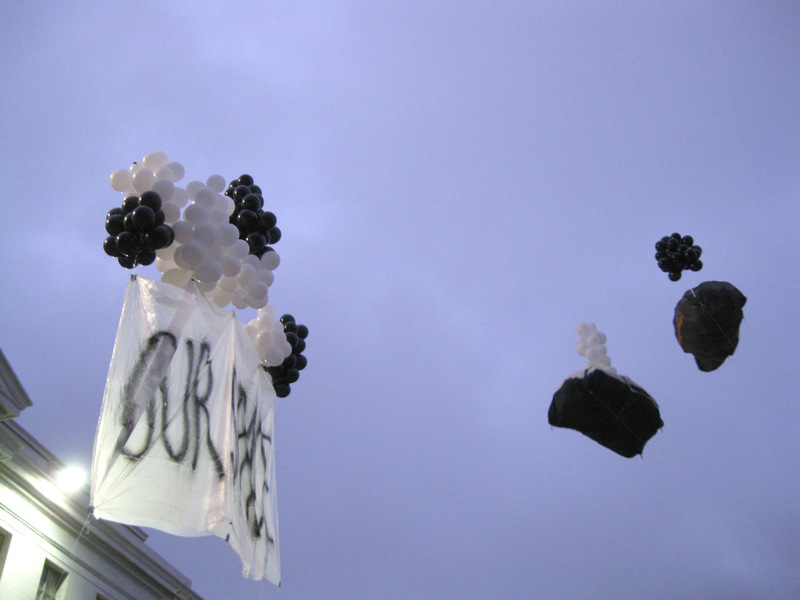 The creative and powerful intervention designed by CED students went viral, astounding people all across campus. I realized anew how proud I am to be part of the College of Environmental Design and to have the chance to help CED build on its historical legacy of activism, and fight for a more just future. PS: You can see local news coverage of the CED student intervention online. The interdisciplinary Graduate Group for the Design of Urban Places was established in 1996, and offers the Master of Urban Design degree, a one-year post-professional program that draws students from across the globe. Last spring Dean Wolch and the Graduate Division, invited Dennis Frenchman (MIT), Darren Petrucci (Arizona State University), and Anastasia Loukaitou-Sideris (UCLA) to conduct an external review of the program. The Graduate Group invited them to present their perspectives on the future of the field at a symposium held during their visit. Donlyn Lyndon concluded the symposium with remarks excerpted here. Today’s discussion has confirmed the vitality of the urban design field, and posed questions for urban design education. What are the moves that Urban Designers make? They open paths, draw connections, give imaginable form for processes of development. They give measure to goals for the ways that cities can become, helping cities and residents navigate possibilities. They create the underlying structures through which cities and investors deploy their resources. How do we channel those forces and their latent potential into worlds that are better, have consequence in the lives of generations, capture and release mental energies? How can we know when we are building places that will bring joy and understanding—or when they will loom as hollow symbols of power and nightmares for the underprivileged? We need to make urban design education effective in recognizing what and who we are, how the natural world enfolds us, how and where we consume resources, what will provide inhabitants with both satisfactions and opportunities. And we must learn to do it at varying spatial scales. We need to learn to take action, be persuasive, understand reservations, and forge new perspectives. 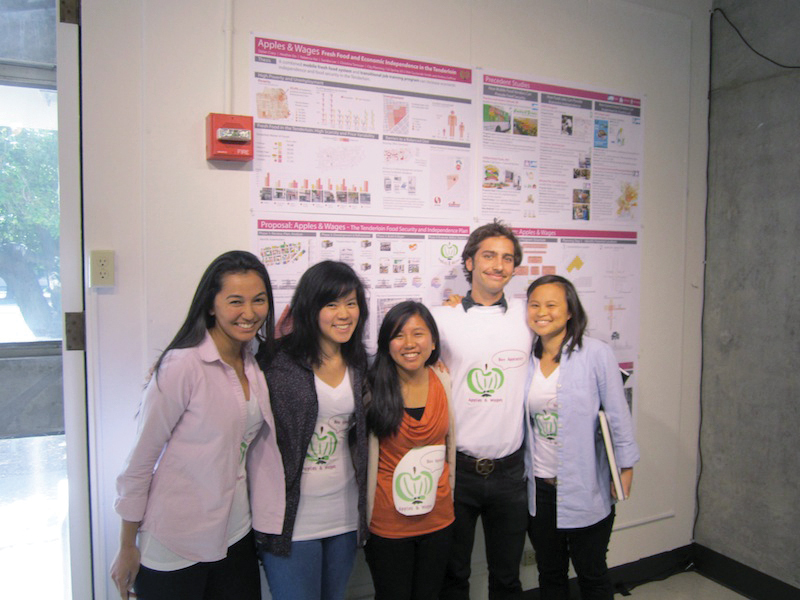 A one-year program is neither the beginning nor the end of an urban designer’s education. It is, rather, a turning point in understanding and imagination. Today, design ideas are communicated differently than in the past, and the social and environmental consequences can be more adequately assessed. Remarkable advances allow us to conceive forms and relationships not easily imaginable and more closely track the impacts of our actions. But where does this lead? Rather than lead, it spreads, consumes, absorbs and mystifies, sometimes even clarifies and exhilarates. We are in danger of losing our way, or rather “ways”—for such complexity cannot be subsumed within one way of proceeding. Many ways are needed, or else we may miss larger transformations taking place beyond our reach. There are compelling arguments for expanding our attention to underserved people, incorporating new ways of thinking about space, form, materials and digital opportunities, and inventive ways to help students design in fresh, creative ways. There have also been cautions. 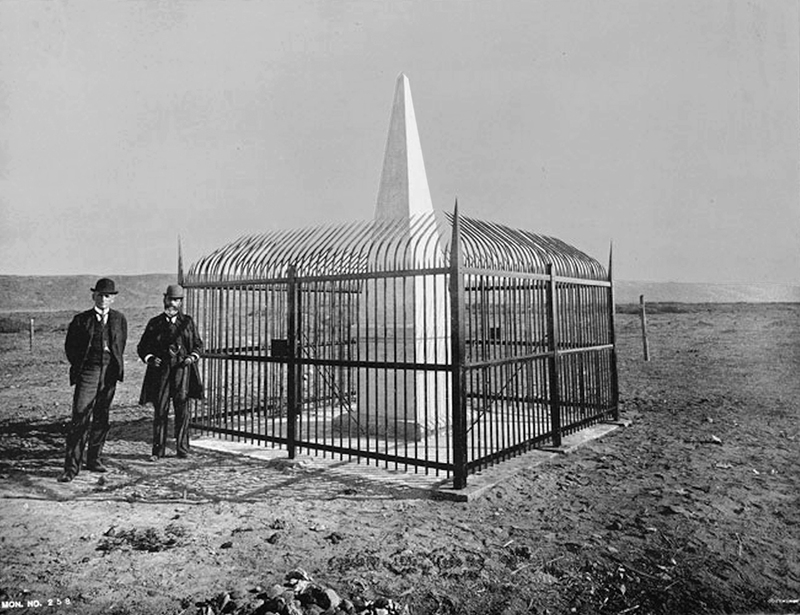 Novelty can put a gloss on forms and relationships that are inherently destructive, or can tear the fabric of understandings and affections people have for their surroundings. Cultural norms and economic factors affect understanding and tolerance of change. Many have little chance to root their affections in place, or enjoy their immediate surroundings. Cities have been designed to enable the efficient exchange of goods and the opportunities for work, typically giving priority to the automobile, and sapping the energies arising from concentration and accessibility. We need to learn again how to make walking and seeing and pausing and veering a part of the choreography of cities, building our bodies and spirits, making the physical world more accommodating, and providing room for initiative and possibility. 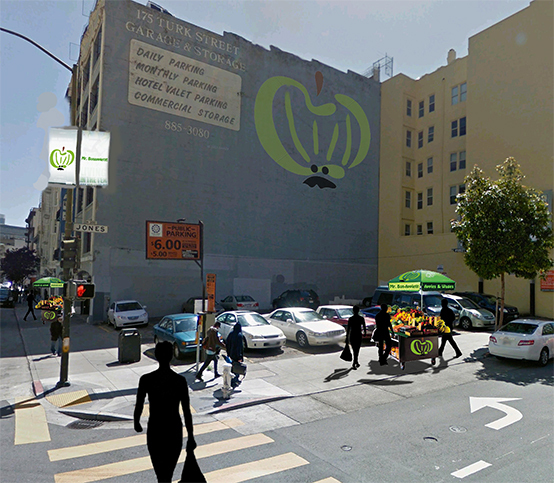 These are things that urban design, physical design properly imagined, can provide. Whatever else we may do, we must make cities and places that perform for the public good, where people can grasp opportunities and forge lives with significance. Cities that all can inhabit in a full, satisfying and productive way. 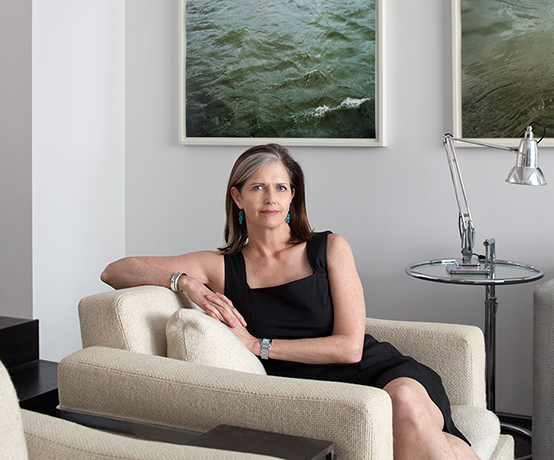 Donlyn Lyndon, FAIA, is Professor Emeritus of Architecture and Urban Design at UC Berkeley’s College of Environmental Design, and the Eva Li Chair Emeritus in Design Ethics. 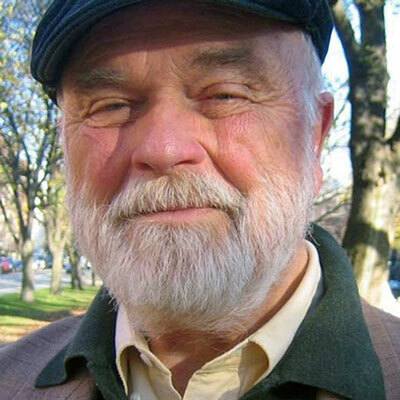 His work as an educator was honored in 1997 with the AIA-ACSA’s Topaz Award. A prolific author, Lyndon leads a design practice and conducts research on the structure of place and ethical dimensions of design.